A Shanghai shipping firm helped deliver materials Taiwan needs to construct a port in the disputed Spratly Islands. Taiwan sought help from a mainland Chinese shipping firm to further the construction of a port in the South China Sea, Reuters reports. 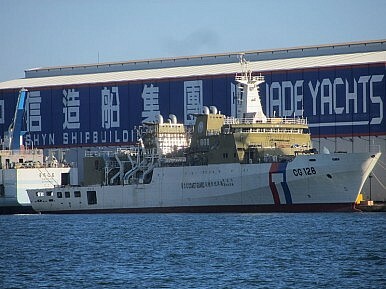 Citing a coastguard official, Reuters said that a vessel from Shanghai Zhenhua Heavy Industry was contracted to bring materials to Itu Aba Island, the largest of the Spratlys, which is controlled by Taipei but also claimed by Vietnam, the Philippines, and mainland China. According to Reuters, the vessel was escorted to Itu Aba by a Taiwanese patrol boat and monitored by Taiwanese ships as the cargo was unloaded. Taiwan turned to Zhenhua Heavy Industry after it couldn’t find a Taiwanese firm to deliver 11 cassions, watertight retaining structures to be used in building a pier on the disputed island. Liao Jaw-ching, director of the construction unit responsible for the port-building project on Itu Aba, told Reuters there were no Taiwanese ships able to deliver the cassions. “This kind of ship is not very common anywhere in the world,” Liao said. Mainland China generally tolerates Taiwan’s moves in the South China Sea as being on behalf of the territorial interests of the Chinese people as a whole, including both the mainland and Taiwan. After all, both governments’ claims are based off the same source – the original eleven-dashed line issued by the Republic of China government in 1947. Last year, a spokesman from mainland China’s Taiwan Affairs Office suggested both sides of the Taiwan Strait should work together to further their claims. “Safeguarding the country’s sovereignty and territorial integrity as well as the overall interests of the Chinese nation should be a common obligation of compatriots of the two sides,” the spokesman said. Beijing’s interpretations of Taiwanese claims in the region allows for cooperation in a way we would never see elsewhere. It’s impossible to imagine, for example, a Chinese shipping vessel being sent to deliver goods to be used for Philippine or Vietnamese construction projects on disputed islets. However, Taiwan is not likely to pursue substantial cooperation with Beijing on the South China Sea issue — even the use of a Chinese commercial vessel has concerned some Taiwanese legislators. While the subtext of cross-strait cooperation is interesting, the greater point is that Taiwan, just like the mainland, is actively building up the territory it currently possesses in the disputed region. Like other regional claimants, Taiwan is concerned that a general military build-up in the region could threaten its existing control over disputed islands. As a reaction, Taipei is fortifying its position on Itu Aba. Taiwan plans to spend $100 million upgrading the existing port and airstrip on Itu Aba. According to Reuters, the new facilities, scheduled to be completed by the end of this year, will allow Itu Aba to host “3,000-tonne naval frigates and coastguard cutters”, while also expanding the airstrip to accommodate Hercules C-130 aircraft. Last October, Taiwanese officials said they were “discussing” the possibility of permanently stationing armed vessels at the island. However, these moves have been largely overlooked as analysts focus on Beijing instead. Itu Aba was not included in the Philippines’ arbitration case against China, an omission that sparked some controversy in Manila. Still, both Vietnam and the Philippines spoke out against the possibility of Taiwan permanently basing armed vessels at Itu Aba. Weekend reading to fully understand the implication of the historic South China Sea ruling. 5 Takeaways: A Closer Look at the Historic South China Sea Arbitration AwardSouth China Sea Homework for Taiwan’s President-ElectChinese Surveillance Aircraft Enter Taiwan's AirspaceWhy a US Sale of Fighter Jets to Taiwan MattersAre Taiwan’s Citizens Willing to Fight Against China?